Throughout history, the environment has been thought to play an important role in our health and wellbeing. Asylums constructed between the early and late nineteenth century were predicated upon the belief that a tranquil, orderly architectural response, paired with extensive landscape views, could aid the restoration of sanity. 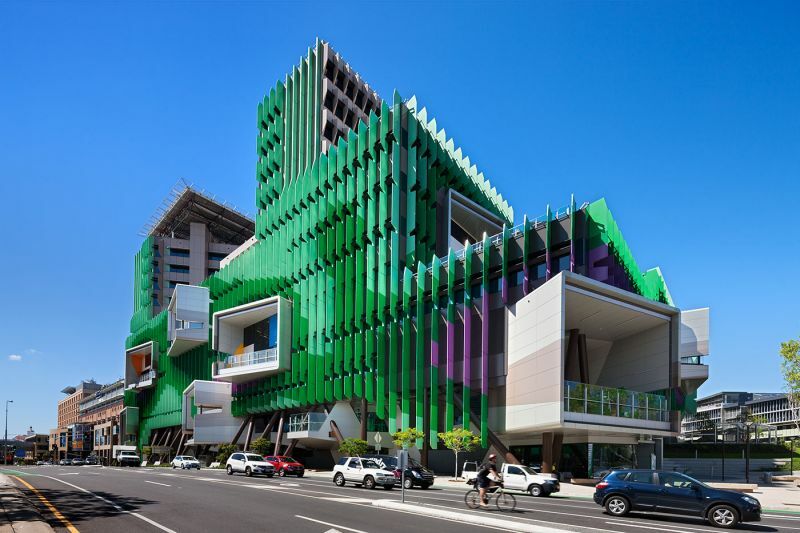 Lady Cilento Children's Hospital, Brisbane. Image: Nils Keonig. Similarly, the emergence of Tuberculosis Sanatoria in the late-nineteenth century regarded access to sunshine and fresh air as necessary curative provisions. Today, the value of the built environment in contributing to the wellbeing of hospital users has returned to the spotlight. Faculty researchers have commenced a substantial project that will examine best practice hospital design. In a seminal study in 1984, Roger Ulrich found that patients with a landscape view from their hospital bed recovered faster and required less pain relief than those who underwent the same surgery but spent their post-surgical days gazing at a brick wall. His work inspired the emergent field of Evidence Based Design (a term derived from Evidence Based Medicine) that seeks to understand exactly how the environment impacts on our physical and mental wellbeing, and whether we can quantify the value of good architecture in the treatment process. Can specific room arrangements, for example, reduce patient falls; could various lighting configurations minimise errors in the dispensing of medications; to what degree could a landscape view result in cost-savings owing to shorter lengths of stay and less resort to pain medication? The role of the physical environment on our mental wellbeing, and its corresponding value, is far more difficult to quantify but cannot be overlooked. We know that in the case of chronic illness, for example, feelings of depression and anxiety can impede healing. We also know that poorly designed environments can exacerbate anxiety while those that respond to best practice can contribute to a positive patient experience. Three recently completed projects put Australia at the global forefront of paediatric hospital design: the Royal Children’s Hospital (Melbourne), designed by Bates Smart in association with Billard Leece, the Lady Cilento Children’s Hospital (Brisbane), designed by Lyons in association with Conrad Gargett, and the soon-to-be completed Perth Children’s Hospital designed by a consortium that includes JCY, Cox Howlett and Bailey Woodland, and Billard Leece. Julie Willis (Faculty of Architecture, Building and Planning) is leading a research team – Corbett Lyon, Stefano Scalzo and Codey Lyon (Lyons Architecture); Philip Goad, Alan Pert and Rebecca McLaughlan (also of the Faculty) – that is investigating the cutting-edge architectural strategies employed within the design of these three hospitals and their benefits to wellbeing, for patients and their families. 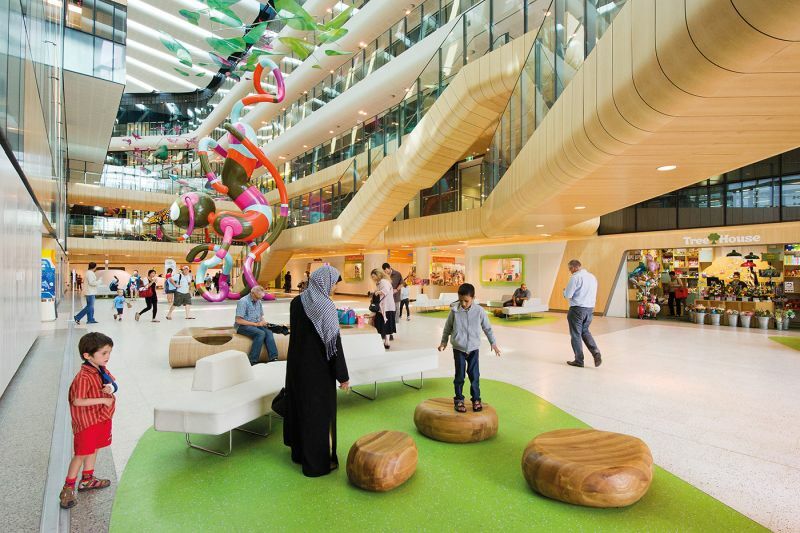 With funding from the Australian Research Council, the Melbourne School of Design has partnered with Lyons Architecture, designers of the Lady Cilento Children’s Hospital, to undertake this project. Our research will interrogate existing recommendations for best practice in contemporary hospital design relative to four key considerations: how easily users can navigate the hospital; the relative success of various features designed to distract patients (for example, aquariums, movie theatres, artworks); whether hospital users value the inclusion of nature within the hospital environment; and the relative value and frequency of use of the various social spaces provided within the hospital. The ease with which a hospital can be navigated has implications for wellbeing but also for staff productivity. A study completed in a 600-bed hospital in the USA calculated the hidden costs of navigational difficulties as equating to 4,500 hours of staff time that was lost in giving directions. For patients and their families, being lost within the hospital environment can contribute to stress, evoking feelings of helplessness and depression, often compounding the loss of control that is already being felt relative to the illness itself. Yet there is relatively little research that directly assesses the comparative performance of different navigational systems. Our research will examine how hospital users respond to the various elements used within the three navigational systems, for example the use of floor plans versus signage, colour coding, visual theming, the use of large numbers and/or exterior views to aid orientation. Royal Children's Hospital, Melbourne. Image: John Gollings. Environmental psychology has taught us that the way a space is designed impacts on the degree of socialisation that takes place within it, while non-architectural interventions designed to enhance social support within the hospital environment, such as peer and family support groups, have been shown to improve clinical outcomes. Despite having a reasonable knowledge of how design effects socialisation within student residences, suburban settings and high-density residential developments, we know much less about how aspects of the hospital environment influence social interaction. Although the effects of various waiting room designs on patient anxiety and stress have been examined, few spaces beyond the waiting room have received the attention of researchers. Our project aims to understand how the various spatial provisions within these three hospitals might encourage peer support networks, enable time to be spent with siblings and parents, and facilitate opportunities for patients to spend time with friends from beyond the hospital. The question of whether adequate private, reflective spaces are being provided alongside social spaces will also be addressed. Although existing research suggests that patients react positively to the inclusion of nature within the hospital environment, both real and evoked (through gardens and views, nature-themed interior design, navigational systems and artworks), this research has primarily been conducted with adult patients. Our research will investigate whether children value nature to the same degree that adult patients do and the relative usefulness of varying forms of nature – is a picture of a garden, a fish or a meerkat really an adequate substitute for the real thing? Distraction is another key design strategy in contemporary paediatric hospital design. Being encouraged to think about something other than their illness or current procedure has been shown to lessen the stressors of the hospital environment. The distractions provided across the three hospitals being examined include play spaces, movie theatres, aquariums, meerkat enclosures, gardens and artworks. Franklin Becker et al have been upfront in stating that there must be a tipping point whereby constantly improving healthcare environments no longer results in any significant physical benefits with regard to patient wellbeing; a criticism that has already been publicly levelled at some of the hospitals we will be studying. Furthermore, Becker posits this observation against the realities of rising healthcare costs, the increased demands of an aging population and a nursing workforce that is also aging. By evaluating the relative success of the design strategies and spatial provisions already being provided in line with best practice recommendations we hope to better understand which are the most beneficial relative to the wellbeing of patients, their families and hospital staff. This project represents a unique opportunity to inform hospital design into the future.